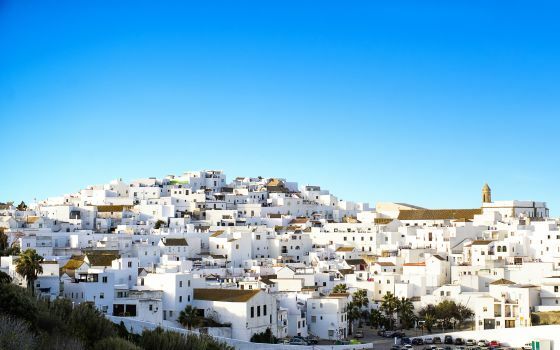 After a couple of weather-wise amazing weeks in November, the storm hit the area of Vejer last weekend. It started with showers from Tuesday and onwards, but peaked big time in the night between Saturday(26/11) and Sunday(27/11). Thunder and lightning all night. Huge rain drops and hail. 150 l/m2 of rain within 24 hours. Sunday morning we woke up to floods everywhere, roads were cut off and the authorities recommended everybody to stay at home. Never in the 11 years we have lived here, have we experienced such heavy rains. It was horrendous. Here are some photos I have found on social media.. The day after the damages were devastating. More than 300 houses were water damaged, animals drowned and roads ruined. The small river running at the foot of Vejer had turned into a lake. Most of the water has now found its way to the sea, turning the Atlantic into a muddy, brown colour. But there is still a lot of cleaning up to do. We, living on a hill top, were lucky. Apart from a couple of small indoors puddles(it’s an old house! ), we stayed dry. Cleaning up on the 340N between Vejer and Conil. It was just another Monday evening, – and then NOT!!! We had been invited to the event: Tradición & Gastronomia at Bodegas Tradición. This winery in Jerez de la Frontera is known for their high quality, fully aged wines. Most of their sherries and brandies are more than 20+ years old, – only the Fino is younger. Focusing only on making aged wines through traditional techniques, all the wines bottled at Bodegas Tradición are considered to be among the highest standards, and this strategy has gained them a place in the leading group of traditional wine makers from Andalucia. Besides their beautiful wines, Bodegas Tradición has an incredible collection of paintings which one can enjoy while tasting the sherries and brandies. A selection of great Spanish artists of different styles which all have been a part of History, including: Goya, Velázquez, El Labrador, Valdés Leal, Maella, Carlos de Haes… – you can also find beautiful hand-painted tiles made by a very young Picasso. But here we were, – on a Monday in May! The whole town was busy, due to the wine fair Vinoble 2016(29th – 31st of May), where people from all over the world come to experience these flavourful drops. The fair was also the reason for this event, where hundreds of glasses of Fino, Amontillado and Cream was offered with tasty snacks. Because like all the great wines, they are as splendid alone as they are with the right dishes. Again regarding the food, there was nothing spared. And very interesting dishes as well; We tried everything from sushi(great with Fino or Amontillado) to more traditional Spanish style. The two favourites were a beef meatball in a pomegranate sauce, made after an original 1000 year old recipe from Mesopotamia(went really well a Amontillado), the other a raw fresh tuna from Valencia with just a hint of soy sauce. It´s odour was pure saltwater and it was so tender you could chew it with your eyebrows (as we say in Denmark). Actually there was so much food that even Thomas at the end had to throw the towel in the ring. Today Renault launched a new car; the Talisman. And in that context; to create some attention Renault had made a competition, where 20 lucky people would be invited on a special GastroTour of the area. El Campero in Barbate, considered as one of best tuna fish restaurants in Spain. The Alevante in Chiclana de la Frontera, run by two-star Michelin chef Angel León. The event started here in Patría with breakfast. The Talisman car has four different driving modes; Eco, Confort, Personalizado & Deporte(=sport). Our job/mission was to create four types of breakfasts, with these modes in mind. It was a beautiful day and we believe that they 1½ hours later drove on quite happy. “I don’t really have anything to show you! Just a lot of weed!”was the first sentence Andrés uttered. Thomas and I looked disappointed at each other. “Really, just weed? 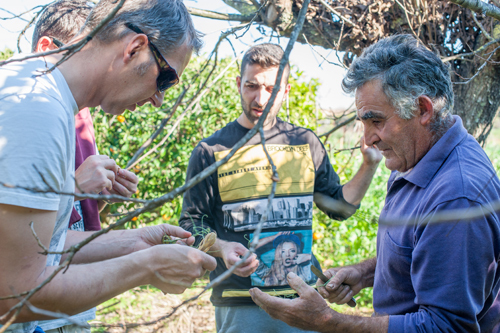 ?” Through our chef, Nino, we had been introduced to Andrés and had arranged a field trip to see his ecological vegetable garden, orange- and lemon plantation. Excited as we were, we had invited our friend fotografer Kelly to shoot lots of photos of the produce. Was it all in vain? But luckily it didn’t take long for Andrés to warm up, and soon his passion for the “garden” became very clear. It also became clear that his first allegation was very much an understatement. 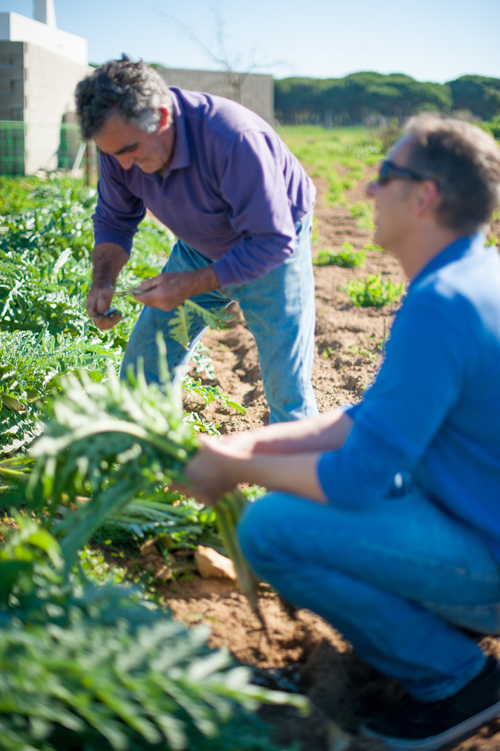 He showed us from plot to plot; peas, artichokes, medlars, cabbage, carrots, laurell, cauliflower, red cabbage, spring onions, chard, oranges, lemons, – and we tried it all. Even the limes; handpicked and halfed we drank the juice directly from the fruit. I wouldn’t normally drink lime juice, but this was so refreshing and tasty. He picked some nuts from a tree, opened them and we were enjoing the most full-flavoured pecan nuts ever. He pulled up vegetables, handpicked fruits, cleaned those that needed it and gave us piles and bags filled to the limit for us to bring home and try out. I tried guyava fruit for the first time and was gobsmacked! Even though his land isn’t that big, it is a lot of hard work. The place was so well kept and the produce standing so healthy and fresh. And the weeds? – well, nearly nothing; that just shows how utterly modest many Spanairds are. 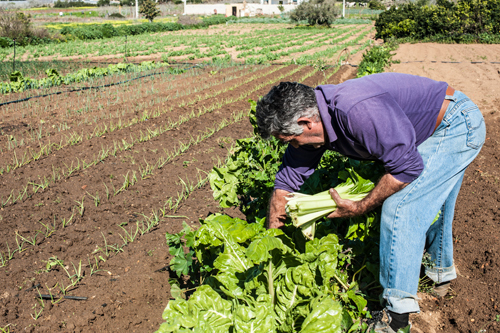 I for one, know how many extra man hours you have to put in to grow ecological produce. Being a daughter of a farmer, I never forget the endless days in the sugar beet fields… My dad was determined that to hoe the sugar beet fields manually was the best way to get rid of the weeds. One of our neighbours even mocked him about it: “Why use all that time hoeing the beet fields, when you can kill all the weed by spraying in less than half the time? Man, you are too oldfashioned!” I hated helping out in the beet fields, – it was boring and very hard work. But it has also made me aware of why organic produce has to cost more than the industrial farmed produce. 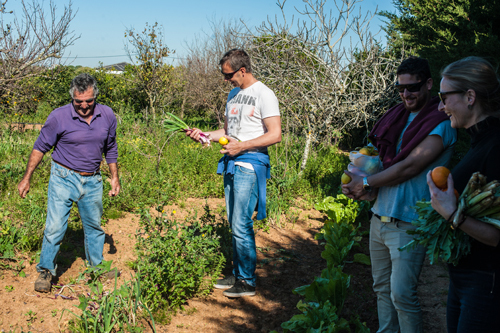 Walking around with Andrés in his “huerta”(vegetables garden) on this warm, sunny February day, you could feel his pride and joy about his work and we just can’t wait to get his vegetables into our kitchen and serve them for our guests, – and off course make organic juices and lemonades of his fruits. Since we moved to Spain we have bought and thrown out a lot of plastic bottles, and I mean A LOT!! The tap water has a distinct taste of chlorine and it’s not recommended to drink directly from the tap. Becoming more and more aware how much plastic we consume every day, we decided to try to make a small difference. To bring our own shopping bags and always decline the plastic bags in shops, supermarkets etc. Three months ago we stopped buying plastic bottles, but only glass bottled water. Now this week we took it a step further and invested in a water decalcification system (our tap water was measured to contain 35% calc). 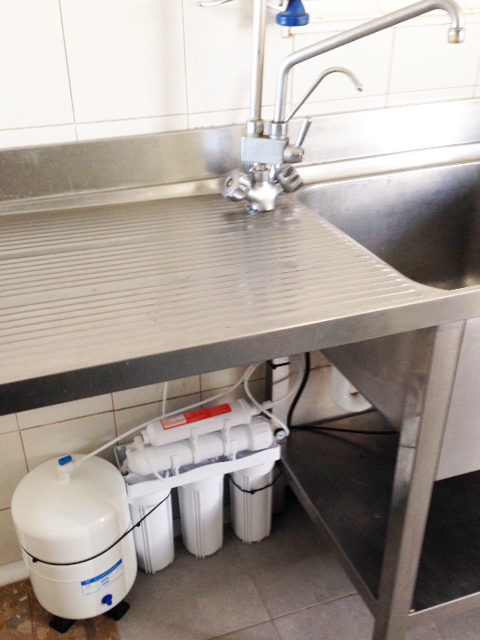 Futhermore we have had a reverse osmosis water system installed to remove large majority of contaminants from our water. Now we can drink water directly from the tap and tastes great. I’m so happy that we finally had it done! But the big question is: “Why didn’t we do it years ago! ?” I don’t know, but videos like one in the link below, made us realize it was time to make a change. Even though it is just a small drop in the sea, it’s better than doing nothing. And I enjoy my water more today than I did a week ago! When you move abroad you find yourself missing out on many of the special Christmas traditions of your home country. In Denmark; Christmas time is also the time of darkness, cold weather, snow and staying indoor. Therefore it can be a bit difficult to get into Christmas spirit living here in Southern Spain. This year even more; we still have temperatures between 16-22 degrees, blue sky and the sun is shining bright. Is Santa going to wear shorts this year? But we do our best and have keep the traditions that suit us the most: We bake Christmas cookies, decorate the Christmas tree, watch the yearly Danish Christmas television serie(one episode every evening until 24th of December) and the kids get a small gift every Sunday of Advent. But we have also adopted some Spanish traditions. Celebrating the Three Kings on 6th of January, visiting nearby villages when they “dress up” as ancient Bethlehem. And from this year adding one more: ZAMBOMBA! A zambomba is an instrument, made out of a clay pot, fabric and a stick, that is used to keep the rythem while hords of people sing Christmas carols. 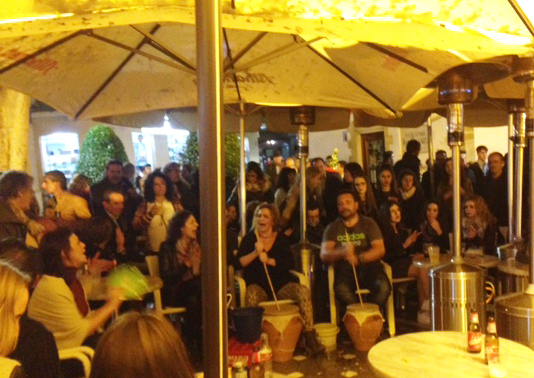 Zambomba is also the decription of the sing-a-longs you can experience in Spain, and especially in Jerez de la Frontera during December. If you vist the town during the weekend you can’t avoid bumping into the Zambomba choirs on every corner of the bigger squares (Plazas). Young and old join in on the singing, clapping and even flamenco dancing. It is joyful and you can’t help yourself joining the party. 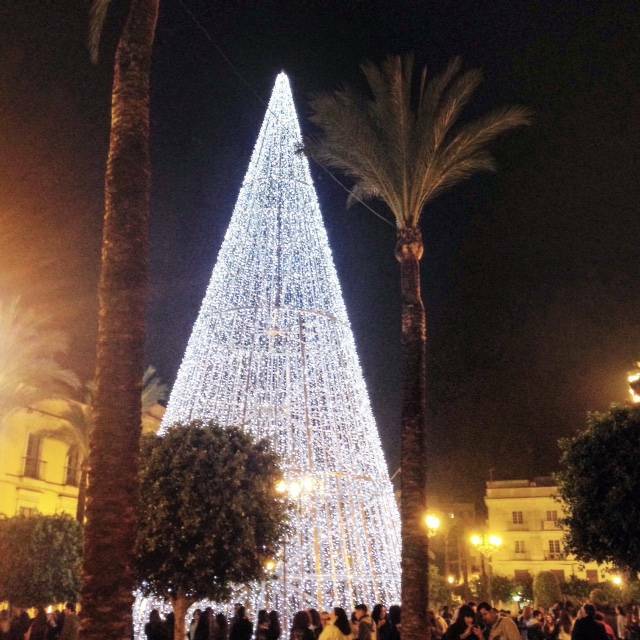 Visit Jerez de la Frontera and zambomba your way into the spirit of Christmas.